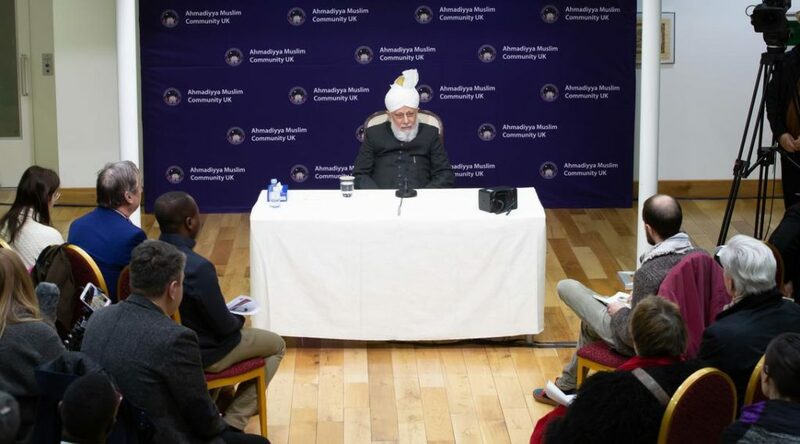 Prior to the keynote address of Hazrat Khalifatul Masih Vaa at the 2019 Peace Symposium at Baitul Futuh, London, a press conference was held that hosted an entire spectrum of questions, especially since the media wanted to take the opinion of a Muslim Leader on matters related to Islam. The on-going issue of jihadis returning to the UK was also brought up a couple of times with regard to what manner of action the British Government should take? Hazrat Amirul Momineenaa further cited the example of the Holy Prophet Muhammadsa entering into the treaty of Medina with other religious groups in order to grant religious freedom and emphasised that the Islam he knew never taught extremism. It has been argued that war, as controversial as it may sound, plays a role in economic growth (the journalist who asked this question gave the example of the economic unity of the EU being a result of war). When Huzoor’saa opinion on this matter was sought, he responded by disagreeing with such a notion. 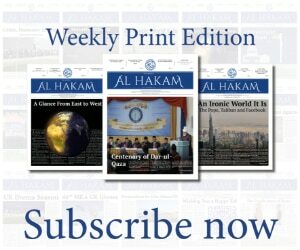 He stated that if this was to be the case, then all war-torn regions should be economically developed. Especially in the case of an Indo-Pak war, it was apparent that such a scenario would leave nothing but destruction in its wake reaching further than the subcontinent. A journalist asked whether we would ever achieve world peace? The answer, in light of present circumstances, was negative. Huzooraa added that there would be no peace without letting go of vested interests. On the matter of a solution to a war between India and Pakistan, Huzooraa commented that the major dispute was over Kashmir, which should be resolved through the UN. If the UN was truly serious and wanted to resolve this issue, then India and Pakistan would be ready. Huzooraa further stated that the road map for ending this dispute was the one laid out by Sir Zafrulla Khan Sahibra. Another question presented to Huzooraa was whether he had met the Pope and if not, whether he would like to? Huzooraa stated that he had not yet met the Pope, but would like to and described Pope Francis as “an open-minded person” as he had travelled to Middle Eastern countries. In recent years there has been a growing interest in Africa with trade and industry growing rapidly. A journalist asked Huzooraa about establishing peace in the African continent. Huzooraa replied by stating that if the rulers were honest, discharged their duties properly and provided opportunity to all their people then this would lead to peace. The rulers needed to reform themselves. On the question of nuclear weapons beings necessary as deterrents, Huzooraa stated that this was just a “flimsy excuse” as nuclear weapons were not saving countries, but destroying them, especially due to the economic disturbances they cause. Huzooraa then cited the example of the Cold War between Russia and the USA. The press conference concluded with Huzooraa meeting dignitaries in the Aftab Khan Library and then proceeding to Maghrib prayer followed by the main function in Tahir Hall. Huzoor’saa opinions and comments were cited in various media outlets including the Evening Standard, Sky News, the Daily Mail and the Mail Online.